In deze mail staat een link waarop het vierendertigste DKARS-Magazine is te downloaden. This mail contains a link which the 34th- DKARS-Magazine is available for download. I'll be working a Vibroplex bug on this month's WES. I bought it a year ago and never really used it because I couldn't reliably get the speed where I was comfortable using it. Recently I built something to help control the speed and didn't stick out 3 miles off the end of the pendulum. Here is a link to print your own. If you would like to own one and you don't have access to a 3D printer. See video for more information on how to get one shipped to you. I'll hear you for the WES when I get off work this evening. I'm doing some experiments with using an apple orchard as an antenna array. I'm seeking help from an antenna expert on what the best way to connect the rows of wires holding up the trees might be for optimal performance as a receive antenna. I've created a short video which shows the orchard and how the wires are arranged. If you have a minute, take a look at the video and let me know what your thoughts are. Editor......What a nice & specially guy! Does any one know just how many prefixes for licensed amateur radio stations, world wide, exist ???? I expect a few more than zero and a few less than infinite number. Dear SKCC Members and others. We have been using the N9SSA website for calculating the Miles Per Watt distances for our QRP MPW Award but that site is no longer available. I am looking into alternate sources of distance calculations and one possibility is using the same method QRP/ARCI uses which is the info from QRZ.com. When you look up a station on QRZ.com, go to the "Details" page and you should see a distance and bearing listed. I have software I can use for now so we do NOT have to halt the issuing of the MPW Awards but I would like to find something each Op can reference himself also. I will issue an update as soon as I have resolved this issue. Use a grid square calculator. The most it can be off is about 100 miles. I'm a fan of the Vizkey cootie. It's very comfortable to use - if you like swing music then this is the key for you! The newly released larger base enhances its charms. 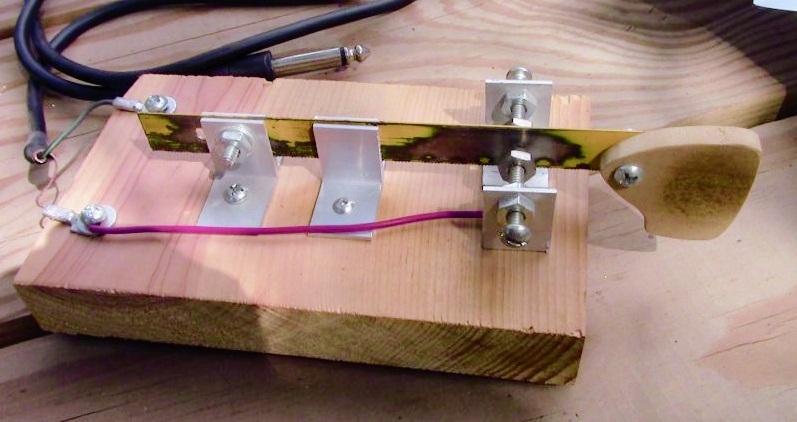 Several years ago I built a little 40m CW receiver for a friend who just wanted to listen to some Morse Code because he had been a radio operator in WWII. I also wanted to try my hand at Manhattan construction. My friend passed away several years ago and his son returned the receiver to me. Since I am trying to accumulate some funds for another radio goodie, I'd like to see if I can sell the little receiver. I believe it is built from the receiver design of the Small Wonder Labs SW40, but its been so long, I can't be sure. It tunes from about 7.020 Mhz to about 7.050 (doesn't quite make it to the 40m skcc frequency, although a capacitor change can adjust this). The only controls are the frequency knob and a volume knob. It runs nicely with a 9v. battery, and the power connector fits that. Just plug in the battery, plug in headphones with 1/8" plug, and connect some kind of antenna and you're ready to go! I just tried it and it still works fine. The plain aluminum box is about 4-3/4" x 4" x 2 ". Can't be much simpler than this! Contact me off-list (wrmoore at gmail dot com) if you're interested. I'd like to get $30 for it, plus shipping. We have a great group in the SKCC. The vast majority of our member do indeed exhibit good operating practices. Sometimes it is helpful just to remind ourselves from time to time. We have all made mistakes, myself included. This does not apply to just DXing, but rather, to all on the air activity. Thanks, Rich, for a most polite and respectful post. For the most part, hams are the most courteous group of people with whom I come in contact. There's always room for improvement and WE ALL need little reminders every now and then. Is the technique for sending by hand, as demonstrated in this film, a good way to send by straight key? I'm not so sure... I send a bit differently. Remember, there is the “right” way, the “wrong” way, and the “Army” (or in this case, Navy) way. This style of sending was developed for the unique operating conditions of ships at sea. Note the style works well with the “Nary knob” style finger piece and allows you to keep control of the key in turbulent conditions. Airborne operators have a very similar problem and solution. There is also the “European” way with the arm completely off the table and all movement is arm, not wrist or fingers. The “American” style with the arm resting on the table and either the wrist or fingers moving the key. Then, of course, bugs and cooties. Finally, variations and combinations of all of the above. I’d say whatever style you use that is comfortable for you and does not cause pain after extended operating is a good method for you. My style varies depending on key, operating requirements etc. I may simply use fingers to tap a quick SKCC exchange on my Junker’s Navy but for a WES that would exhaust me quickly not to mention drive the arthritis in my hand to extreme discomfort because of the extended operating time. My Kent key is most comfortable to me if I use the European style. My J-38 style keys work well American style. For long operating sessions, switching between keys and styles keep me from burning out by using just one set of muscles. I guess the direct answer to your question would be to try it and see if it works well for you. If it does, great; that is one more style in your skill set. If it does not feel right, ignore it and use what is most comfortable for you. I occasionally use a Remington "Radio Telegraph" model all-cap mill for copying radiograms on Radio Relay International nets. 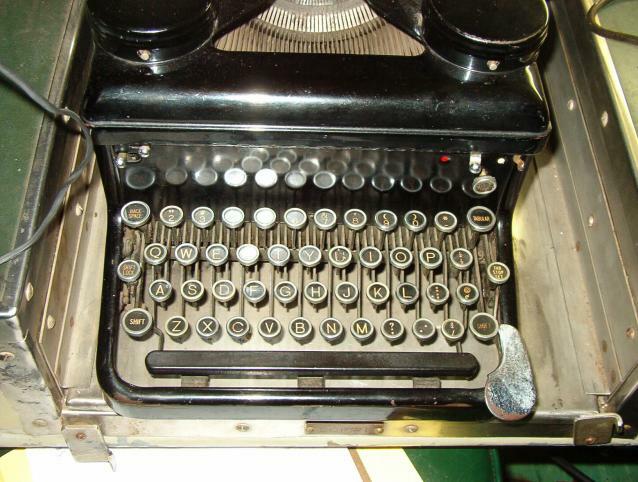 At one time, I had three Remington Mills brand new in the box, which I purchased at a typewriter supply store in Brooklyn, NY. I donated one for use during telegraph demonstrations at the Western Development Museum in Alberta, Canada. The second one lived at a club station in the basement of an American Red Cross Chapter until an incompetent city employee connected a pump backward and filled the basement with sewage, thereby destroying everything including the mill. Now there's one left and it lives in my shack! LOL. I wrote an article about all-cap mills in the April, 2014 issue of the "QNI Newsletter." Another view, albeit from a bit of a distance, can be found at the bottom of my "QRZ" biography page. I use a mill on occasion, but I have found that I can do better on the computer keyboard. Plus, I use software for managing the radiograms I send and receive on the traffic nets. K8BZ did a great video demonstrating copying on a mill. Here are pictures of one of our three mills un the WW2 Submarine USS COD SS-224. It still works great, I use it all the time. now in good working order. some well meaning, but ignorant previous owner with WD-40. 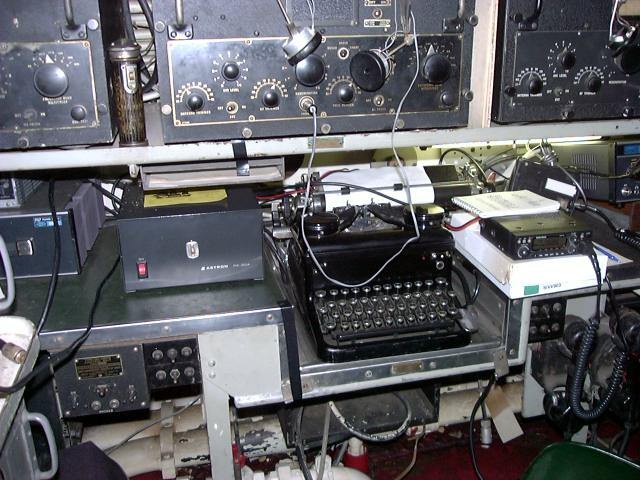 Here is a short video of the our radio room aboard COD. The video shot about nine years ago on VHS tape and then digitized and uploaded. I just looked at the video again and am embarrassed as it looks like someone mashed all the keys on the mill. I think I will re-do this video with newer video equipment. In the video, you'll see our RAL/RAK twin pairs, RBO, Collins TCS-12, TBL-7 transmitter and more. BTW, if any of you folks will ever be in Cleveland, Ohio, and would like to tour the boat and/or operate the station, we'd love to have you, so please feel free to get a hold of me. I’m familiar with CW and what morse over the air sounds like but I have no background with actual telegraphs where morse originated. I gather the closing of the contacts and the subsequent release makes distinct sounds? And, since the connection is normally energized with the contacts closed, the first sound is the release of the telegraph? Or does the actual message begin after someone’s broken the connection at least once, and the first sound is the re-energizing of the relay? IOW if I send “dash dash” would that be “... click-long pause-clack-short pause-click-long pause-clack” or “...clack-long pause-click-short pause-clack-long pause-click”? Is the last sound you’d typically hear a “click” or a “clack”? Essentially, the report when the armature is pulled down by the electromagnets differs somewhat from the report when the magnets release and the armature is pulled up by the spring. The telegrapher doesn't really time the difference between these two reports or "clicks" and "clacks," but rather learns the rhythm pattern associated with the Morse characters. It's rather easy to make the transition from tones to the rhythm patterns on a sounder in a code with which you are already proficient in (e.g. a ham learning to copy International Morse on a sounder). Learning American Morse requires that one learn some new and alternate characters, which lengthens the transition process. Nonetheless, it's quite possible to do so provided one engages the process properly. 73, James Wades International President, Morse Telegraph Club, Inc. I have put together four PDF's dealing the restoration of telegraph instruments. The object is to encourage those who have not yet taken the restoration plunge and, of course, to pass along a little bit of information to the next generation. All four documents are illustrated with photographs. Though not part of the above set, there is also a PDF on How to Install Glass Insulators on Chair Legs. Reports from CN8YR homebrew 2x7m vertical dipole (see pics). One wire 7m up and one wire going down to level 0, fed with 450 ohms twin lead.+ smartuner SG 237. My WSPR tx was made from a kit, from W5OLF. Here's a picture of my 20m WSPR tx, but I also have a separate, nearly identical tx just for 30m. This is the entire transmitter. The PIC chip, its brain, is under the "33" label. Your call sign and grid locator data are permanently burned into this chip (by W5OLF). Editor....You must also transmit your power level using a compressed data format! The BNC socket to the antenna is on the right, and the nominal 12 volts DC power plugs in just above the BNC socket. No other connections are needed. 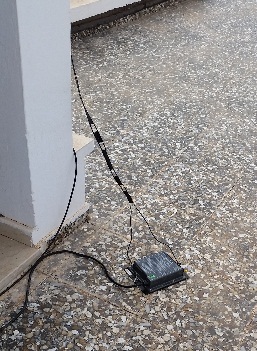 Since I normally use my rhombic antenna with ladder line, the BNC cable connects to a separate, manual antenna tuner with balun, which I leave pre-tuned to the WSPR frequency. 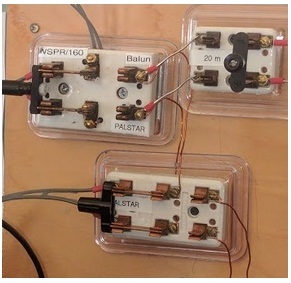 The balanced rhombic antenna feed is switched to different rigs by a small matrix of antique ceramic knife switches. The main difference is that my version has an option for a very low duty cycle, just transmitting every half-hour. The new version, as I understand, can transmit continuously, but after every 2-minute transmission it intentionally jumps to different, pseudo-random transmit frequency within the standard 200-Hz WSPR band. This avoids any chance of being permanently stuck on a single frequency occupied by some other strong station. The new version has slightly better frequency stability than the version that I have. At the moment, I have to switch manually between my 20m and my 30m WSPR transmitters. I'm in the process of building a trivial box that will switch between them automatically, so that I can study the propagation on 20m and 30m at the same time. Note that there is no PC or any other computer linked in any way to the W5OLF design. I have slightly modified my 20m W5OLF version, by putting a second PA transistor (it's just a cheap 2N7000) in parallel with the original PA. This allows me to run 2 watts output on 20m, but the original 1 watt was already more than adequate and I'm quite happy with the 1 watt produced by the 30m tx, with its single 2N7000 PA. I like the W5OLF design, but there are several other designs available now from many different sources, based on an Arduino, a Raspberry Pi or whatever, which may be more versatile. Many of these support multiple bands, unlike mine. When I bought my W5OLF tx, several years ago now, so far as I'm aware it was the only design available. He has been very helpful when I've had any questions. Of course I'd be delighted to help with any questions. Whatever design you might choose, I'm sure you'll find it to be an incredible aid to your CW operating. About WSPR, I have my doubts about above explanation see. Normal WSPR transmissions carry a station's callsign, Maidenhead grid locator, and transmitter power in dBm. using a compressed data format with strong forward error correction and narrow-band 4-FSK modulation. So If the time/sync of your transmission is not correct / not according the WSPR rules they are no reports of your transmision. Apparent frequency drifts greater than ±1 Hz per minute most often occur at the transmitter, and should be corrected if possible. So you need a computer and a frequency stable transmitter, i think. So, I found that (Wim will confirm, as I'm new to this measurement stuff) I can copy to about -13dB, is that right? But then when faced with -14dB, and don't think my tiredness and one-ear-only-earphone is the reason, I can't copy enough. Though I may try again with one in both ears later. In which another of our Side Swipers, Darrel AA7FV is mentioned! And seems to indicate a different measurement? "Darrel Emerson, AA7FV, was the only person ever to achieve Level A." and "The best AA7FV was able to do by ear was Z7, which is 9 dB stronger than Level A, i.e., a key-down SNR of –0.6 dB at 100 Hz. but no characters copied. " How do the dB in these two tests relate to each other? Are you both familiar with each others tests? The dB appear to be different in these tests? I'm totally a layman in this stuff so I don't understand the values, sorry to say! I think you subtract 17dB from the above, so Darrel could copy in Wim's test -17.6dB?! I could copy I think (yet to be confirmed) most of things with fair accuracy up to and including file "h" but then file "i" for me was "only the presence of a signal could be detected but ONLY A FEW characters copied and not with any certainty"! All good fun and thanks to OM Wim for conducting this interesting experiment, we look forward to reading the conclusions! Wow, are we in interesting and talented company in the Side Swiper fraternity! Have fun taking part in Wim's test! That's a step back in history. The ZRO tests were organised by AMSAT in the early 1990s for reception of weak CW signals from Oscar 13, when the satellite was at its furthest point from the earth. The tests were conducted periodically on 144 MHz and on 432 MHz. A series of random numbers was transmitted from the satellite in CW. .... 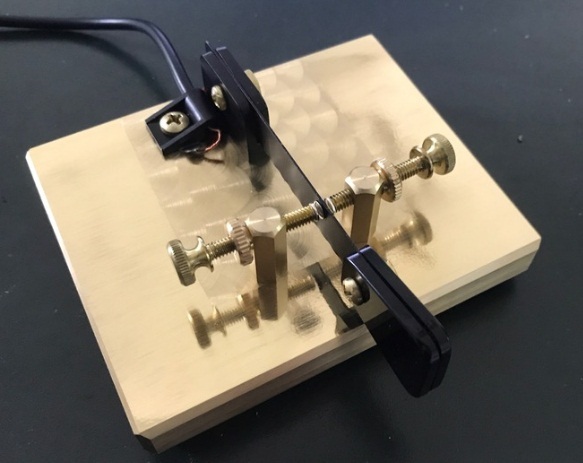 The competition was to see what was the weakest level that you could decode perfectly, so it involved setting up a fairly high gain antenna pointing in the right direction, with low noise antenna amplifiers. A good antenna only took you so far, because you would start picking up the background noise from the satellite transmitter itself, so beyond that a better antenna couldn't help. My claim to fame was that I was the only person ever to decode the weakest level, ZRO A. To do this I worked on a digitized recording of the signal, using extensive FFT filtering down to a few Hz bandwidth, tracking the drifting frequency (varying Doppler shift etc.) and using software to sync to the slightly changing speed of CW transmission, buried in the noise, with a bit of probability theory thrown in. All processing used the computer language FORTRAN. There's also a link to the original data file there. The comment on my just being able to decode level ZRO 7 by ear, was just to emphasize how far into the noise the FORTRAN digital processing was getting. A full write-up appeared in the January 1994 issue of QEX, and the Proceedings of the 11th AMSAT Annual Meeting and Space Symposium. I'm not sure exactly how the s/n of -0.6 dB for ZRO level 7 was calculated in the article you found, but I'm guessing they just compared the power in the CW signal to the noise in a 100 Hz bandwidth. I think the other test you've been using had the noise in a 2500 Hz bandwidth (is that right? ), so if so then the conversion between the two scales would just be the ratio of the bandwidths. (2500Hz/100Hz) is 14 dB. So, -0.6 dB in the 100 Hz would become -14.6 dB in a 2500 Hz band. This is the latest Space Weather forecast video, from Tamitha Skov. Well done vieux Durk, Oant sjen Durk! Mods to my HB key. Changed the paddle to a larger one and added acorn nuts to the contact screws and put in a set of brackets closer to the contacts to make it a little stiffer.